With Halloween upon us, there are many things we can all do to make it not just fun, but safe for the children who go door to door for tricks and treats. While many of them seem pretty basic, there are numerous stories every year of children who are injured or worse. Always practice Halloween safety! 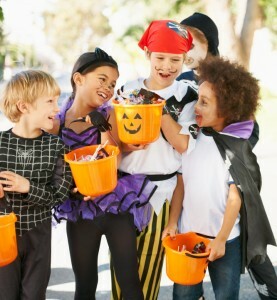 Most children walk to houses during Halloween, so it’s so important to pay attention to their surroundings, including cars, other people, and walking surfaces such as potholes, cracks in the sidewalk, and unpaved dirt paths that could be sloped and dangerous. Always look both ways before crossing the street. This goes without saying. Put down the cell phones for a little while and pay attention. It’s hard to see where you are going or who’s coming at you when you’re staring at a phone screen. Drive Carefully, Especially on Halloween! Kids and parents are everywhere on Halloween. Crossing driveways, walkways, and streets. It’s a good idea to drive BELOW the speed limit, as kids sometimes dart across streets to get to the house that gives out the best candy and isn’t always paying attention. Be proactive rather than reactive and slow down! Avoid costumes that could be misconstrued or potentially dangerous. Halloween weapons such as plastic pirate swords and fake guns can often be difficult to see at night, and if you think it might be viewed as potentially dangerous, it’s best to leave it at home. Check all candy and other items before anything is consumed. Only visit well-lit houses. If the house is dark, skip it and move on to the next one. A piece of candy isn’t worth putting yourself in a potentially dangerous situation. Halloween is a really fun holiday for the kids and parents alike, and can be super safe if you take precautions, and use your head about how you plan the evening. Have fun, don’t get too scared, and don’t eat too much candy!